Chhatrapati Shivaji himself is said to have considered this India’s most impregnable fort. 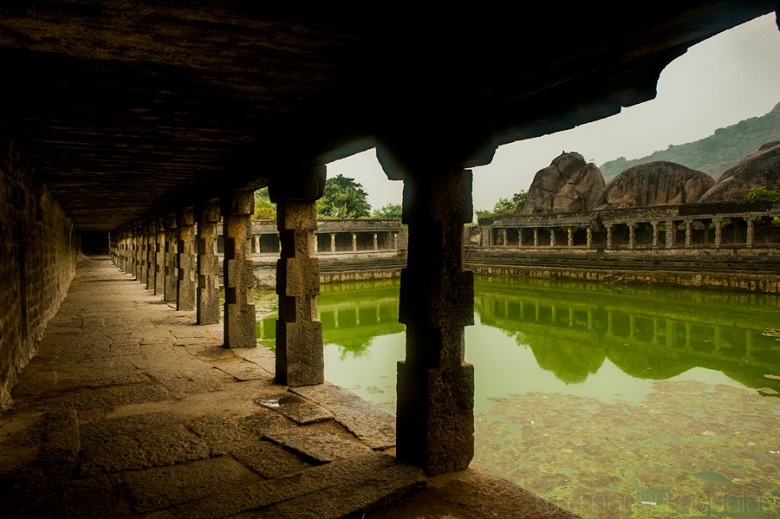 The fort of Gingee (also called Senji or Chenji) in the Villupuram district of Tamil Nadu, has been occupied by most dynasties of medieval South India. 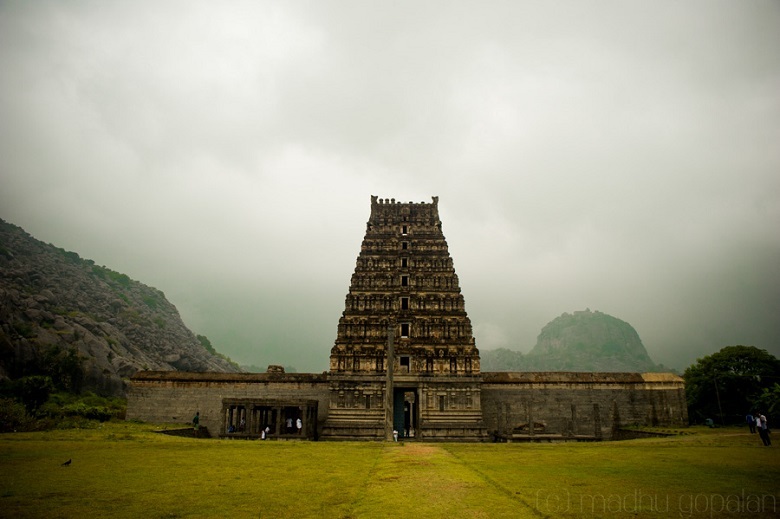 It is believed to have been built originally in the 13th century by the Chola rulers. By the end of the century, Gingee came under Hoysala rule, and then Vijayanagara rule, under which it rose to prominence. The Vijayanagara kingdom was huge, so the administration of this region was entrusted to the Nayaks (or Nayakas) of Gingee, who were like viceroys, and enjoyed increasing autonomy through the years. 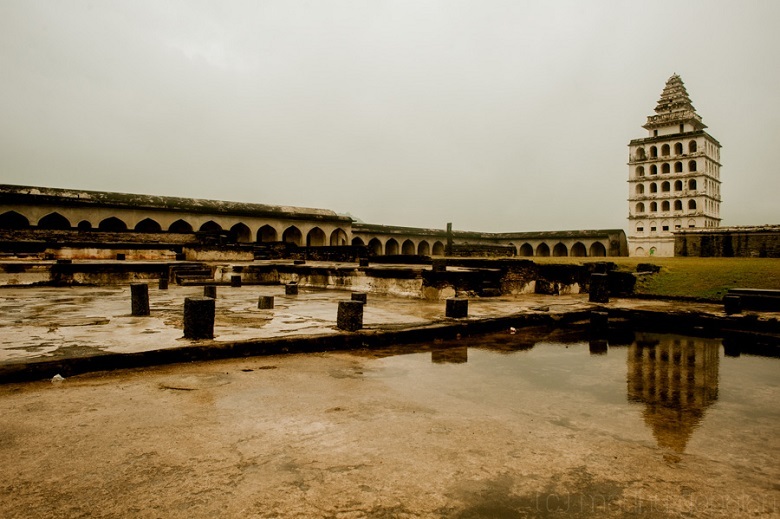 In the middle of the 17th century, Gingee passed into the hands of the Bijapur Sultanate. The Maratha king Chhatrapati Shivaji conquered it about 3 decades later, but it was taken by the Mughals soon after that. In the 18th century, the European powers arrived at Gingee - it was first under the French, then under the English, and then it finally faded into obscurity. Most of the rulers who held Gingee made additions and modifications to the fort through the ages. 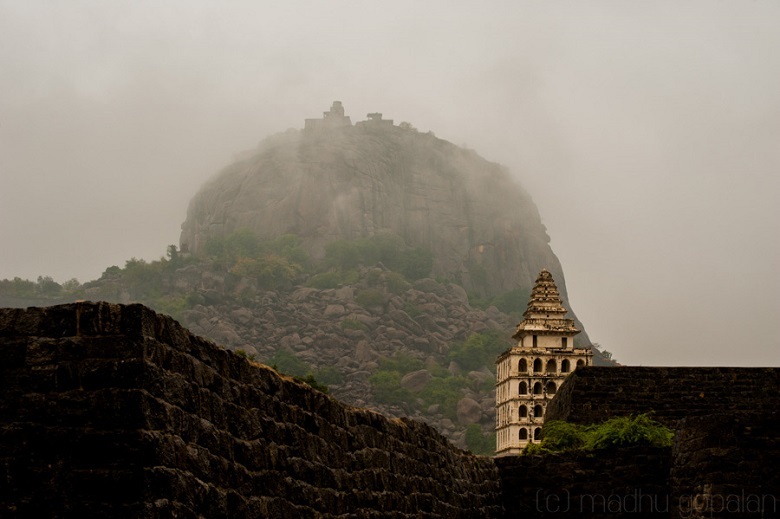 The fort is built on three hillocks – Rajagiri, Krishnagiri and Chandrayanadurg, forming a huge triangular enclosed area peppered with royal, religious and military structures. It is evident the moment you enter Gingee, how hard it must have been for an enemy army to invade while being attacked from 3 hills simultaneously. In fact, Chhatrapati Shivaji himself is said to have considered this India’s most impregnable fort. Rajagiri is the most important part of the complex, and the most tightly defended of the three hillocks. It is surrounded by the innermost line of granite fortification, and encloses all the royal structures. The Kalyana Mahal, a seven storeyed tower-like structure with a pyramidal top, is probably the most iconic structure here. 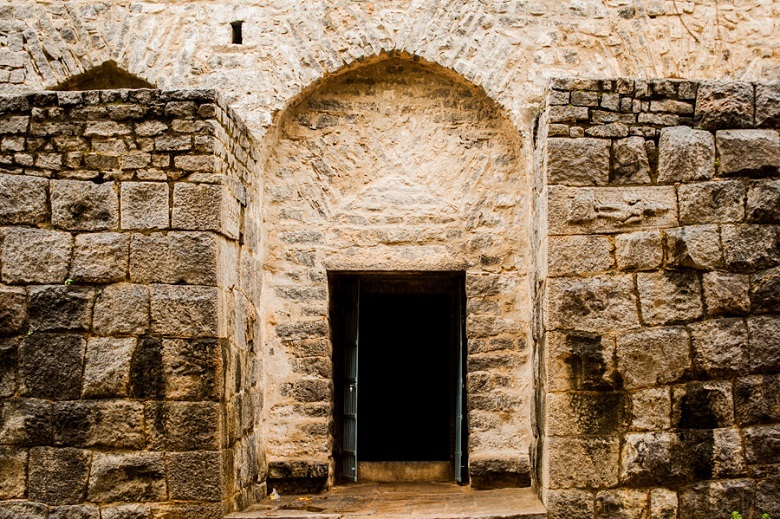 It is accompanied by an assortment of arcaded stables, remains of palaces, etc. The open ground next to the Mahal has a wide stone platform overlooking it. A smooth cylindrical stone resembling a bolster, is placed on one side of it. This was probably used for audiences with the kings. The lower regions of the Rajagiri hillock also have remains of palaces, granaries, batteries and a big, beautiful stone tank called the Elephant tank. A temple dedicated to Kamalakanni Amman, the guardian deity of Gingee, sits atop the Rajagiri hillock, along with watch towers, canons and other strcutures. 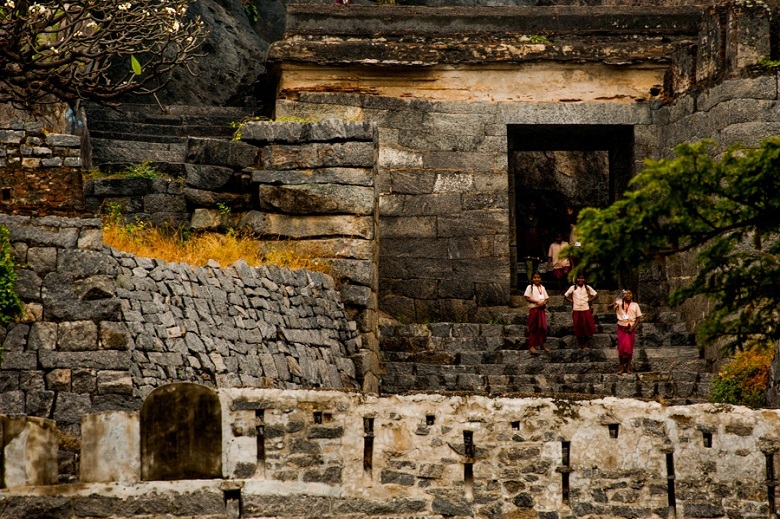 One of the most exquisite structures of Gingee, is the dilapidated Venkataramana Temple. Standing outside the innermost fortification of Rajagiri, it is believed to have been built in the 16th century, by the Nayaks. The most interesting character associated with Gingee is Raja Tej Singh, known as Raja Desingh or Desingu Raja locally. During the Mughal occupation, Aurangzeb, granted Gingee as a jagir to Raja Swarup Singh, his general from Bundelkhand. After Swarup Singh’s death, the Nawab of Arcot (the Mughal governor of the Carnatic region) tried to assert his authority over his son, Raja Tej Singh. He demanded that Tej Singh pay taxes even though he was a feudatory of the Mughal emperor. When he refused, the Nawab proclaimed him a defaulter, and declared war on Gingee. 22 year old Tej Singh, who was in Bundelkhand at the time, rushed back to defend Gingee against the Nawab’s mighty troops with his small army. Sadly, the young warrior lost his life in the battle, and his wife is said to have immolated herself on his funeral pyre. Desingu Raja, to this day, is hailed as the hero who died trying to protect Gingee. At a distance of about 160 kms from Chennai, and 70 km from Pondicherry, Gingee is a great choice for a day trip from both places. It must be mentioned that the images in this photo essay were taken on a very rainy day, and normally, the rocky area around the citadel is very hot. 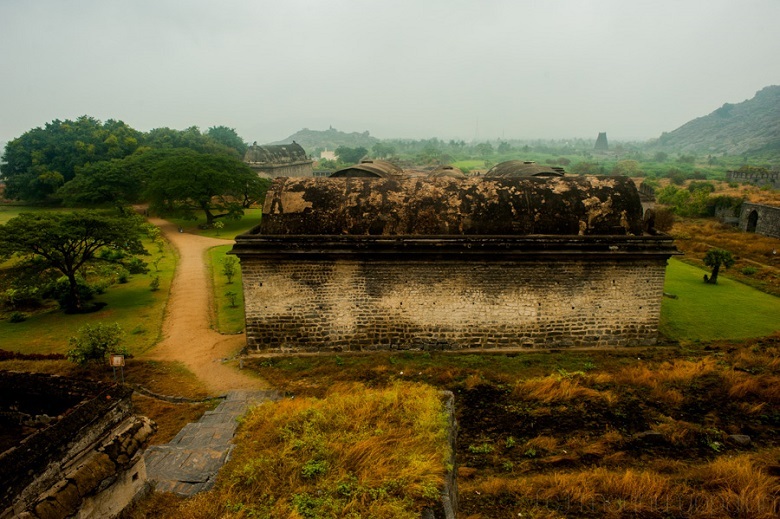 Regardless of the weather, however, this massive fort with its tumultuous past is without a doubt, one of South India’s most magnificent forts.